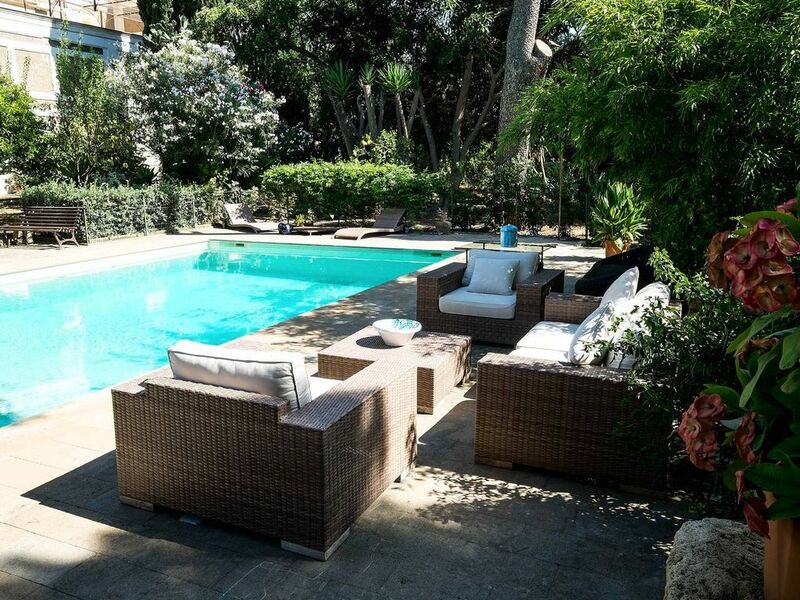 Welcome to the beautiful Villa Trabia, a haven of peace in the heart of Sicily. If you want peace and elegance, welcome to this place. The Cottage is furnished with historic family furniture, beautiful carvings on the wall. good equipment (bed linen, air conditioning and fans in every room, washing machine), The delicious kitchen is suitable for preparing meals that in spring and summer can be eaten on the terrace (there is a microwave, a large refrigerator with freezer and a traditional oven). The pleasant terrace is shaded surrounded by trees, a real plus. Even the beautiful pool is surrounded by trees and beautiful vegetation. The little extra: access to private parking, very practical in Sicily, parking is sometimes rare. We are happy to share a part of the Sicilian heritage. Lateral situation, very convenient to reach Palermo by car, 25 minutes on the highway or in 10 minutes by train from the nearby Bagheria Station also go Cefalù is simple in just an hour. The locotion is very functional (supermarket, bakery, pubs and restaurants and pizzerias are located 50 meters from the house. If you are looking for authenticity and calm and anti Ikea then do not hesitate. Perfect location for all local facilities & a lovely, quiet setting. Size more suited to 2 people than 4 & kitchen v v small! With all good offerings around - that was not an issue for us. Very well located for touring & some wonderful things to be seen. The local contact - Angela- was brilliant. She made regular contact with us & really took a personal interest in ensuring that everything was ok. Her bar/restaurant recommendations were all perfect. Enjoyable, but not for the faint-hearted. We enjoyed our stay, although it was highly stressful at times. The apartment has two roomy bedrooms and a sizeable living room, all tastefully furnished but the kitchen space was tiny with access for one person at a time, inadequate for two let alone four people. To welcome us , we were given a bottle of wine but only one wine glass. The outdoor space is very pleasant and the grounds are extensive and interesting. The swimming pool hours are rather limited,10a.m. to 6.30p.m., although we were allowed to swim before 10, provided the pool was not being maintained. It is a good sized pool in a lovely setting. Bagheria is a busy town within a labyrinth of very narrow streets. Driving is hazardous by any standards due to double parking, lack of signage, and scooters whizzing by haphazardly. SatNav is more of a liability than an asset. Finding the Villa was a nightmare, since we were given no directions from the management. The link we were sent was empty, and it was simply sent empty a second time when we informed Giacomo (the manager) of the problem. Fortunately, a local policeman helped out by driving there with us following in our own car. The gates of the villa are kept locked at all times, and Angela, Giacomo's assistant, had to wait outside for us to arrive to let us in. Given that we spent over an hour driving around trying to find the place, everyone was stressed out by the time we arrived. When we finally did arrive, Angela was very kind and as helpful as possible. One day, having locked our bedroom door from the outside, the lock failed to open. It was lunchtime, which is sacrosanct. So we had to wait until after 3pm before someone came along with a hammer and an oil-can to open it. Again very stressful. About a week before arrival, we were told that the apartment would not be ready on time, and offered an alternative for one night. Given that we did not know where the first apartment was, finding a second one seemed to pile on the pressure. Fortunately, the first apartment, was made ready in time. But the stress of not knowing was not good. We loved the cottage in Bagheria. It is located in the middle of Bagheria at 2 steps from the main street. However due to the fact that the cottage is part of the larger property Villa Trabia, you could not hear anything from the city center and you can simply relax. The hospitality was also a plus: Angela showed us all the main items in the apartment. We arrived on a Sunday around the closing hour of all the supermarkets. Angela immediately drove us to the nearest supermarkets until we found one which was still open. Step back in time and relax. The first impression of Orange Cottage was better than the website. The furnishing and fit out of the cottage was done with care, and in keeping with its surroundings. Both the outside sitting area and the pool were much bigger that suggested by the pictures. It is one of 6 or 7 self contained single story units tucked away in the corner of the grounds of a splendid Villa on substantial grounds (3-4 HA) right in the centre of Bagheria. Check out Google earth. The large green area which is easily 3-4 street blocks wide is Villa Trabia. One limitation alluded to in another review is the size of the kitchen, but do you want to cook on holidays? Think of as a galley on a yacht, fully fitted but compact. The large fridge freezer is sufficient to hold as much food and drink as any family needs. If you must cook there is a 4 burner hob, oven and microwave. The owner was on hand and very helpful. The garden has a supply of tomatoes; you simply pick them and eat. Another lovely touch was the welcome pack. The cottage is 5 minutes from the Autostrada and a trip to the Sicilia Outlet is recommended. 140 + shops, especially for men. The train to Palermo is cheap (€5 return), frequent, so do not think about driving there. I would also recommend not to blindly follow the sat-nav. Some of the streets are extremely narrow, made worse by 4 metre cars in 3 metre spaces. Better to stick with the wider streets, and let the sat nav recalculate the route until you find your way around. Did I mention driving in Sicily? Simple, don’t stop, show no fear, and keep moving. Really it is no worse than anywhere else, just go with the flow. In conclusion, a great place to stay. Convenient to all of the beaches, Palermo, and further afield. Equally once you enter the gates, park the car; you are away from the hustle and bustle of life. We booked Orange Cottage as Bagheria served as a great place to explore both Palermo and Cefalu. In addition, our two teenage children could easily access the town for coffee, ice cream and a general wander. In truth, we didn't really know what to expect. Aloisa described the property as a cottage in the grounds of an old aristocratic mansion house (in the middle of a town!). Faded charm and a reminder of past glories. The cottage was simple but extremely clean and comfortable and furnished with old antiques which suited the feel of the property. Ideal for a family of four and a great outside area which was bigger than the picture on-line.The kitchen was small but everything was provided for so not a problem. The pool was great and we never really saw anybody else so had it all to ourselves. We could wander the grounds and only imagine what it was like in it's former life. Alois invited us to pick tomatoes, basil, limes and oranges from the garden and this gave a feeling that we where part of something special. Amazingly, once outside the huge main gates we were in a bustling and traditional Sicilian town. The contrast was fabulous and we all felt privileged to be living on the 'other side'. The main street was seconds away and mostly closed to vehicles. Shops, cafe's, butchers all on hand. We found a couple of excellent restaurants (Fratelli Piombino booked by Aloisa) which the children labelled' best they have been to'. Great food and service. A super coffee and cake cafe yards from the front gates. Away from the town, Palermo was 20 minutes by train which was easy and convenient. Cefalu also great and easy to drive or train. Both a must see. So, in summary a place full of charm, and a real Sicilian experience. Aloisa, was truly helpful and quick to respond to any requests or needs. Always engaging and happy to share the history of the family house. If you fancy something delightfully different this is it. Fully recommended by the whole family. The villa was in a good location to visit the top part of Sicily and it was close to the train station so visiting Palermo very easy. We would recommend the cottage to our family and friends.